Valentines Day. What a day. I had no idea that stores could even stock that many teddy bears and stuffed heart emoji faces. 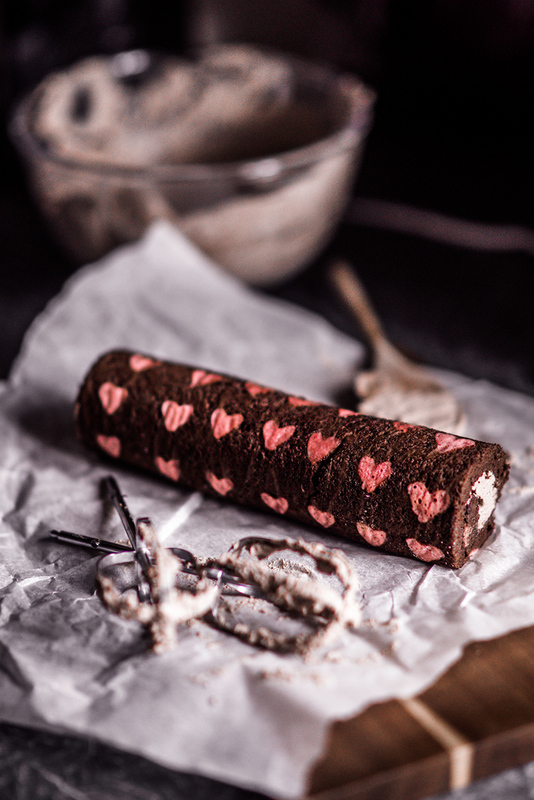 I’m all for celebrating love but Valentines Day is always a bit overwhelming for me, especially as I don’t like chocolate and almost every sweet thing revolves around the cocoa BUT I put my own dislike aside and made this rather light tasting Chocolate Swiss Roll decorated with a heart pattern. It’s easier to put together than you might think and the options are endless! The recipe falls into three different stages; the pattern, the cake and the filling. It’s a quick recipe to make and should only take about 45 minutes to put it all together! In a bowl mix together egg white, sugar and flour into a thick paste. Add melted butter and food colouring and mix well. You don’t want any lumps! Transfer the coloured paste into a piping bag with a very small tip. I used a ziplock bag with a tiny hole cut in the corner. Place parchment paper on top of your baking sheet and draw on your heart shapes. You can use a prepared template (there’s one here) or freehand your designs. Make the shapes small and compact so that air bubbles can’t get through! Once finished place the pan in the freezer while you prepare the cake. In a medium bowl, mix the egg yolks with sugar and blend until pale yellow. Whisk in the melted butter. Gently fold in the egg whites, making sure not to deflate the mixture as you stir. Fold in the flour and the cocoa powder gently stirring to mix all the ingredients. Remove the pan from the freezer and pour the batter over top the patterned designs. Bake for about 7-8 minutes making sure you DON’T OVER BAKE! Once the cake is baked, quickly remove from oven and flip the cake onto a sheet of parchment paper and peel off the back revealing the design. Flip the cake over again so that the design is on the bottom. Carefully, using the paper, roll up the cake into the swiss roll shape and leave to cool while you prepare the filling. In a mixing bowl, combine the cream, sugar and cocoa powder. Mix on medium speed until soft peaks form. Once the cake has cooled, gently unroll it and spread the chocolate filling on the inside, making sure it’s not too thick. Gently roll up the cake once more and place it seamside down. Slice off the ends to reveal your swiss roll!